Preheat oven to 450 degrees. Place the pie crusts into 9-inch pie dishes. Place the beans, sweetened condensed milk, Butter Olive Oil, cinnamon, nutmeg, flour, sugar, vanilla extract, eggs, and egg yolks in a food processor bowl. Pulse a few times and then process for about 1 minute until smooth. Pour the filling into the prepared pie crusts. Bake at 450 degrees for 15 minutes, then reduce the heat to 350 degrees and bake until the filling is set and the crust is golden brown, an additional 35 minutes. Cool before slicing. Eat warm or cold. 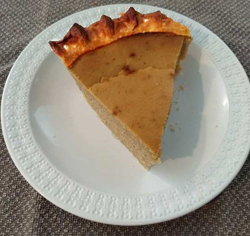 NOTE: For a less sweet pie, use 1 can of evaporated milk instead of the sweetened condensed milk.